I had crossed to the Caribbean in my first Petronella, my 32 footer concrete double ender, which I had lived on for months at a time, with crew, and now was finding too cramped and lacking power to cope with the Caribbean sea. Well, that was half the story. The other half was that I saw this stunningly beautiful boat for sale in PowerBoats yard, Chagaramas, Trinidad, and almost by osmosis knew this had to be a Joshua, the boat Jean Knocker designed for Bernard Moitessier to enter the 1968 Golden Globe non-stop round the world race. She was remarkably like my ferro Petronella, but longer, beamier, a thoroughbred, ketch-rigged, round the world, long-keeled, double-ender in rolled steel. The pinnacle of my ambition as well as Moitessier’s. The first Golden Globe in 1968 was famously won by Robin Knox Johnson in his own heavy displacement, 32 foot, long keeled double ender,Suhaili , which had been parked in the Plymouth boatyard where I fitted my new rudder before setting off across the Atlantic. Knox Johnson had started the race much earlier than Moitessier and as he came into the last leg up the Atlantic his tough old boat was out in front largely because the other boats in the race lacked the strength and stamina to finish the course, but Suhaili was slow and the Joshua was not and Moitessier was expected to overhaul Knox Johnson in the journey from Cape Horn to Plymouth and take the prize. In the end Moitessier decided he did not want an English cup for the mantelpiece he didn’t have and quit the race to sail back into the Pacific to Tahiti to become a legend in his own lifetime. His Joshua is now a national treasure, held by the French maritime museum in La Rochelle. I had hauled my Petronella out for the summer in Trinidad and was a day or two away from my flight home so it seemed all over when I heard the owner of the Joshua was 600 miles north at his home in St Barts. But phones are wonderful things and soon a friend of his and a hacksaw had me inside the boat. Normally I would have spent half a day crawling over the boat and into every locker and bilge but within minutes I was covered in sweat and desperate to cut the experience short. A boat that has been locked up for months in a dusty boatyard is hot as hell by midday in the tropics. But I did notice how neatly the sails and gear were stowed and that there was no unpleasant smell of bilge water, oil or mould. The boat had been left by a caring owner and I figured whatever was wrong was not going to be enough to daunt me. The drawback was simple and profound: I didn’t have the money to buy her. Back in England, chatting to Rm, a sailing friend, I mentioned this fantastic boat for sale. In brief, he came halfers with me and even stumped up my share while I went about selling my Petronella. The deal between us was that at the beginning of the coming season, I would cruise north and as a finale would go to St Barts, where the Joshua would be after her owner had used her to deliver tons of building material for their house building project there, echoing something Moitessier had done in the South Pacific with the original Joshua. I would have a proper look and trial sail, and if this was still the boat I wanted, agree a price on behalf of the pair of us. I would then sail back to Trinidad and Rm would fly out to meet me; then together we would fly to St Barts. Rm would take a final check, hand over the money and we would sail our joint venture back to Trinidad where both "my boats " would be hauled out. That’s pretty much what happened. Within a year I had sold old Petronella and she had been renamed Nellie so that the Joshua called Liebel could be renamed Petronella; and I changed her Moitessier red topsides to Petronella green to match the job I had done years earlier on the now Nellie. Our new Petronella was number 29 of the 70 or so Joshuas built in France by Meta. She was finished in 1976, shipped to Berlin and completed by her first owner. From the time she was launched she was sailed in the Mediterranean and made nine Atlantic crossings before Rm and I bought her and a decade later we brought he back to Europe and rounded up the number of Atlantic crossings to ten. G and I lived on Petronella every winter (the Caribbean sailing season) for a decade. Over the four months or so we went sailing we headed north from Trinidad to visit different islands in the chain. It was a good life. It formed the background research for my cruising book, "Caribbean Passagemaking" and the novel "Summer Storms". We escaped the winters of northern Europe and returned to Britain for the lovely summers. Being based in two climate zones worked well. In summer I worked and G helped by doing the interviews for my research. The cost of haul out and six months on the hard in Trinidad, and the flights to and from the Caribbean, were less than the cost of keeping a forty footer in England. I couldn’t spread the maintenance over a series of weekends, as I would have done if the boat were in England, and I couldn’t go day or weekend sailing, but that was fine. I concentrated on getting work done during the months we were in Britain and I could get a lot of maintenance done in the fine Caribbean weather at the beginning and end of our sailing months. When I first sailed out to the Caribbean I had an intention of going through Panama and across to Australia. Little Nellie was good enough for that but big Petronella was ideal. Yet somehow it never happened. This half-baked idea died under the practical need to earn a living back in England and family ties. Our intense desire to visit Cuba or sail the Eastern Seaboard never worked out either. These places are easier to get to than get back from so they always lost out to the need to get the boat out of the hurricane belt over the summers, which effectively meant going south to Trinidad and hauling out. Events, as ever, dictated plans. Of course, what we were doing was no hardship. We had based ourselves in a fabulous sailing region. The Caribbean sea has predictably strong Trade winds and an even more predictable current and the combination makes for stunning sailing. Forget the headlands of the English Channel and reversing tidal flows; forget grounding at low water; forget days of calm or gales; forget freezing rain or fog of any kind; forget marinas and their expense. 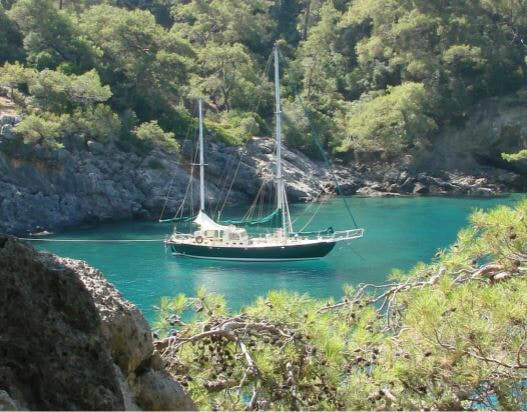 This is tropical sailing among islands blessed with countless anchorages. The new Petronella was an ocean-going boat and even less suited to the close quarters manoeuvring in marinas than my old Nellie, so when we came back to Europe we realised that she didn’t suit the new shore-side regime nor the light to non-existent fickle winds, and even though we sailed her as far south as possible in Europe we were back in the world where winter was a definite season and not well suited to sailing. We had to pass Petronella on to sailors who wanted to get out into the blue water and who recognised the Joshua to be the ideal boat for that. Moitessier heard his Joshua say: Give me wind and I will give you speed. We had a breeze on the Algarve coast. Petronella gave us some wonderful times. Not just in the Caribbean. She gave us a whole winter in the Azores. The Azores was a natural place for Rm and I to stop on our way from our Caribbean departure point of Tortolla to mainland Europe. We took the rhumb route through the Horse Latitudes. This is a shorter route than having to sail back towards Bermuda before finding the prevailing westerlies but it’s slower. Once a boat on the Bermudan route catches those westerlies they might fly. On the other hand, they might also heave to to let the gales that blow around 40N go by. We had no fear of gales in the Horse Latitudes. Our main worry was running out of water and the diesel we needed to keep Rm’s computer charged, so that he could do the work he would have done in England now that our trip wasn’t taking the two weeks he had expected but the month it clearly would. Rm flew back to work the day after we reached the Azores but my plans were fairly open. I might have expected to head north to Britain but this wasn’t written in stone. The days of ditching The Plan and having an unscripted adventure weren’t over for me. I called G in England and she flew out to join me. We spoke to other sailors who had spent winter in the Azores and spoke to the staff at Horta harbour to see what they could offer. Petronella was too heavy for a marina pontoon, so we were offered a place on the wall. We realised we needed a sturdy boat if we were to survive a winter tied to the harbour wall, and that we would need to be around to tend lines most of the time. Well, that’s life on a boat for you. We had a wonderful year. The Azores is stunningly beautiful. The climate is mild all year round, though wet, and the huge winter storms are fierce but magnificent. We gave up on yacht fenders, popping under the pressure of ranging back and forth, and found washed up tyres on the beach, made coats for them, and accepted that we would need to paint that side of the hull in the following year. I wrote the last chapters of Caribbean Passagemaking and started on the novel Summer Storms and did boaty jobs while G found us concerts to go to, events in the library, films to watch in the beautiful cinema, walks to take and taught herself some Portuguese. We had a full social life with other winter yachties and local Portuguese. When the time came to leave Horta and visit the other islands in the archipelago we knew we were not sailing back to Britain. We were going to make a visit to the lovely rias of north west Spain and then go south to continue enjoying the sunshine and life in the Portuguese culture. After a couple of years along the Algarve coast and its rivers we sold Petronella to an English couple with Australia in their sites. They started by taking Petronella to the eastern Mediterranean then they set out west across the Atlantic. 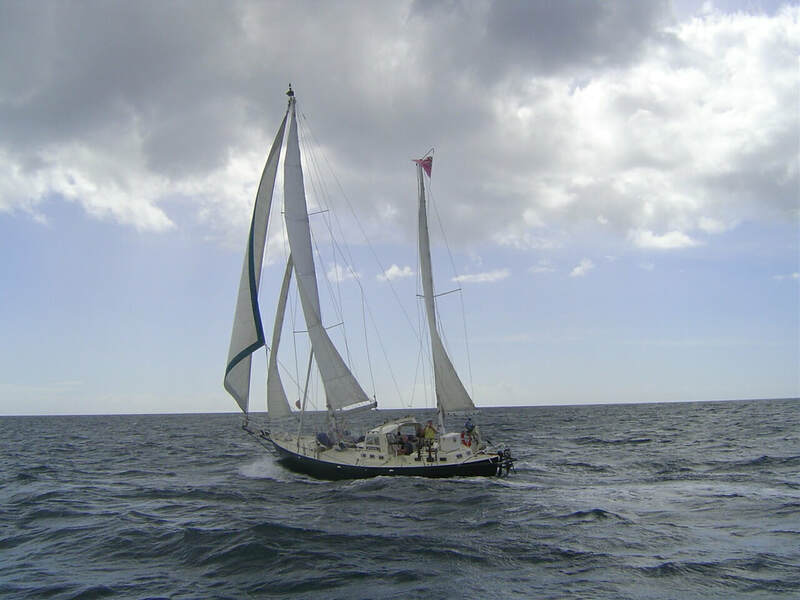 They too had nearly a decade on Petronella before events overtook them and they reluctantly sold her in Grenada. 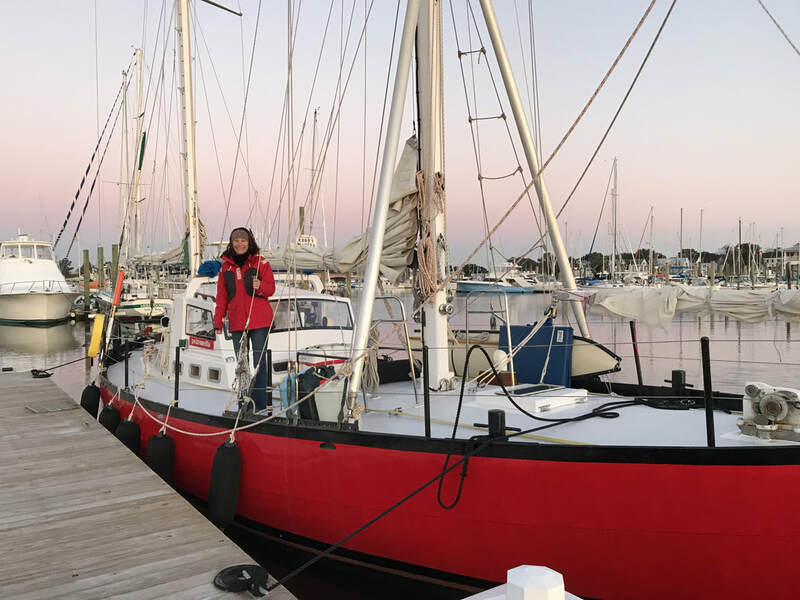 The new owners, an American couple, (authors of "An Unlikely Voyage -- 2000 miles in a small wooden boat") made their test sail the trip from Martinique to Georgetown in the Bahamas, then took Petronella to Florida and made her a US-flagged boat. It’s early days yet but they employed the renowned steel boat builder Howdy Bailey to restore Petronella to near-original condition at his workshop in Norfolk,Virginia, before heading down to Georgia, then Florida, for a winter in the Bahamas. It’s a new life for Petronella but possibly one that will come full circle for a Joshua. The new owner has in mind to sail the next Golden Globe, single handed, round the world race. Whisper it softly. A plan like that is not so easy to fulfil. A friend asked me if Petronella was a good boat for that race. I said: she won't win it but she will finish, and you can't say that about the other contestants. Red is the new Green. The great Bernard would be smiling.